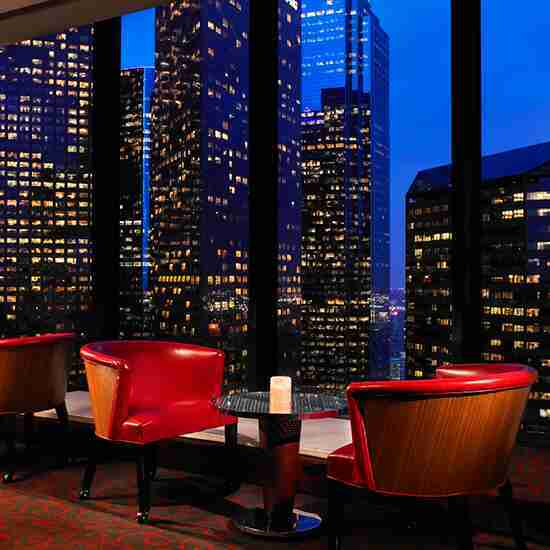 If you’re willing to spend some big bucks, Nobu offers a Grade-A iconic LA meal paired with a Grade-A iconic view. 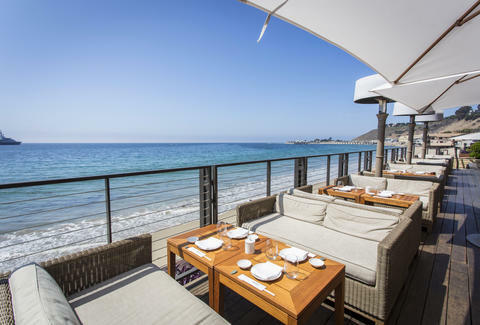 The sunsets over the Malibu ocean, streaked with every color you can imagine, are nothing short of legendary -- and the same goes for the $150 omakase dinner, (hey, at least the sunset is free). The view from the top of the Bonaventure is stunning, day or night. This true-life True Lies filming location also sports some nifty outside-of-the-building elevators, and you really can’t call yourself an Angeleno until you’ve ridden them. Need some liquid courage for the ascent? They’ve got an on-site brewery. 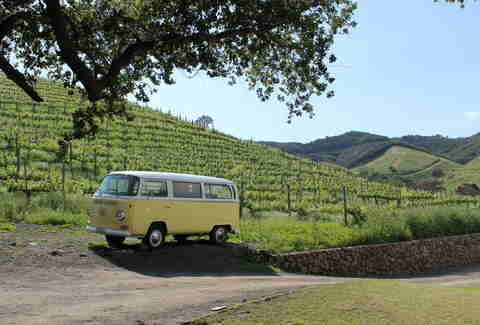 There aren’t a lot of places like Malibu Wines, the winery that’s also a picnic spot, that’s also a bar, that’s also a hiking trail. The Malibu mountains on the hike will blow your mind, but if you’re more in the picnic mood, the picnic grounds (where you can bring all your own food, and order from their gigantic wine selection) are equally as beautiful. Oh, and if you like lookin’ at views of llamas, there’s also a llama farm. Helipad Yoga at the Ritz-Carlton is exactly what it sounds like. At 55 floors in the air, you’ll get 360-degree unobstructed views from Downtown all the way to the ocean. And there’s nothing better than centering yourself/finding peace/whatever yoga does for you better than with a view of all of LA. The views of the Hollywood Hills that you can catch from LP’s 5,500sqft rooftop are pretty much unparalleled, especially at night. Literally eat some Asian-inspired street food (like a crispy pork with chili jam, cilantro, pickled carrot & daikon bao) and drink a tasty drink (like a Life Cultivated Old Fashioned, with Japanese whisky, cinnamon, ginger, lime zest, and cardamom bitters) while you figuratively eat and drink in the sights that our city has to offer. You’re probably thinking that there aren’t enough free museums that you ride a roller coaster to get to the entrance of. 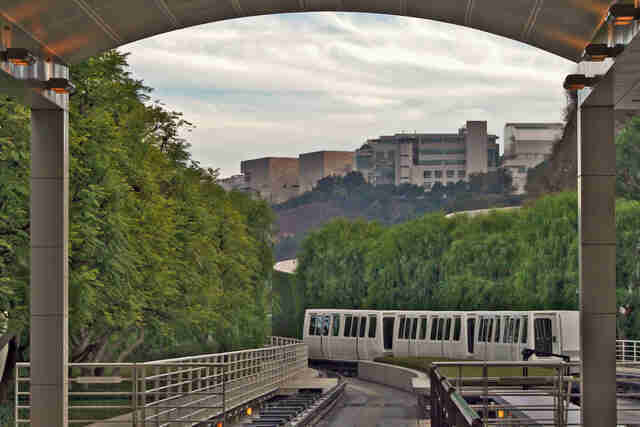 Well, the Getty’s tram isn’t quite a roller coaster (at least, not with that attitude), but it’s still fun to ride up to the top where you can overlook Brentwood, Bel Air, and even some of Topanga State Park. And did you even read the part about it being free? 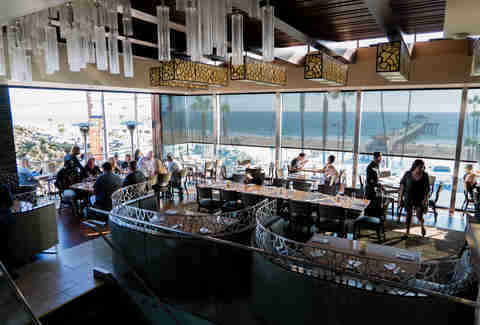 The Strand House remains the undisputed king of the Manhattan Beach views. 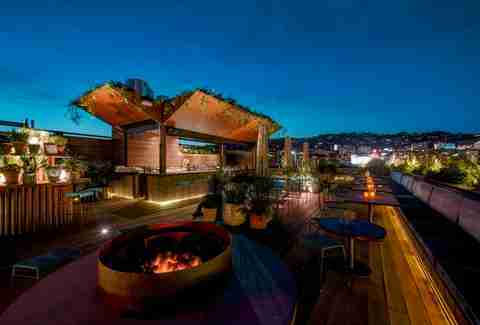 Get a load of an absolutely insane sunset as you get down on tasty treats like wood-fired brussels sprouts with black garlic aioli, a knockout charcuterie spread, and an extensive wine list. 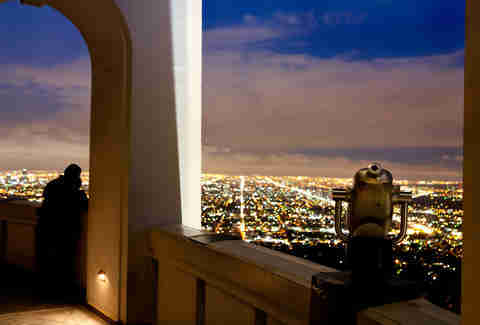 There’s a reason Griffith Observatory is famous, and it’s not just because of that scene from The Rocketeer (people still remember that movie, right?). The views -- of well, everything -- from Griffith are something special, especially during any night of fireworks, like the Fourth of July or New Years Eve. Little did you know that just beyond all those delicious dumplings, noodles, and pork buns are an entire wilderness waiting for you to explore them. 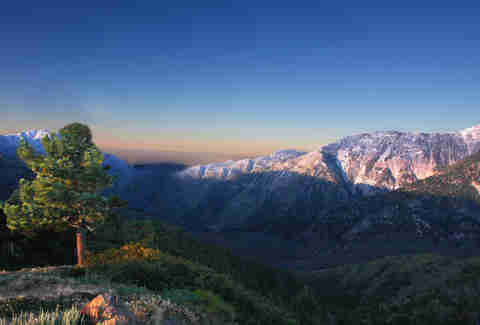 If you feel like really pushing yourself, head up bright & early to any of these peaks nestled in the Angeles National Forest for a sunrise unlike anything you’ve ever seen. For some reason, it’s remained a secret that Perch -- one of Downtown’s best rooftop bars -- has another level above the bar with, yep, an even BETTER view. 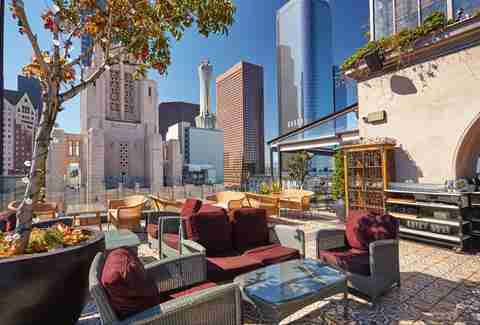 The French-inspired rooftop bistro offers bites like surf-n-turf skewers, with Bearnaise sauce and watercress, and drinks like the Spicy Concombre, with gin, St.-Germain, lime juice, cucumber, and jalapeño, as well a completely electric view of the nighttime DTLA skyline. 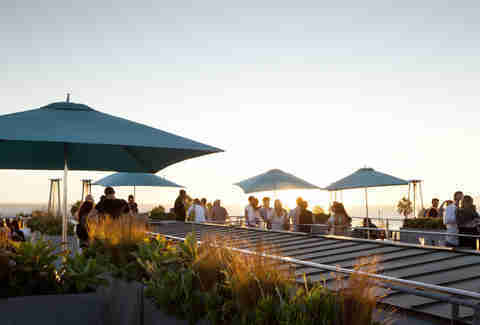 The West Side really feels alive when you watch the sun set on the rooftop lounge at Hotel Erwin. And if you want, you can get some badass view double trouble going if you hit the lounge after an equally beautiful daytime hike through nearby Solstice Canyon. 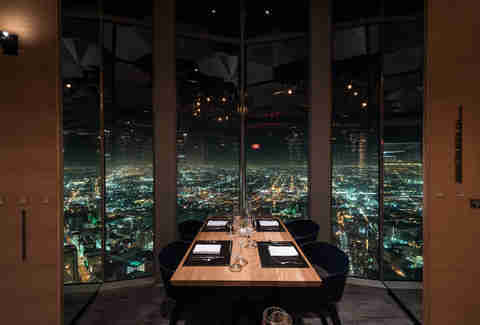 Yeah, yeah, lots of these are Downtown, but c'mon: this new restaurant on the 71st floor of a massive tower OF COURSE has amazing views of the city -- and it’s in the same building as SkySlide, the attraction that slides you down a glass slide over the city, where the view isn’t just out the window, it’s under you. Bingo. Wilder Shaw is a huge sucker for an amazing sunset. Take a long walk on the beach with him on Twitter and Instagram.